Ever since cauliflower was named one of the top food trends of 2014, I've been searching for new ways to spice it up as a side dish. 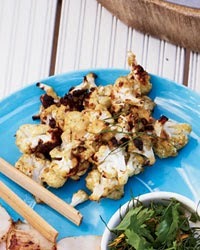 My favorite way to cook cauliflower is to roast it, as it adds another dimension to the flavor. 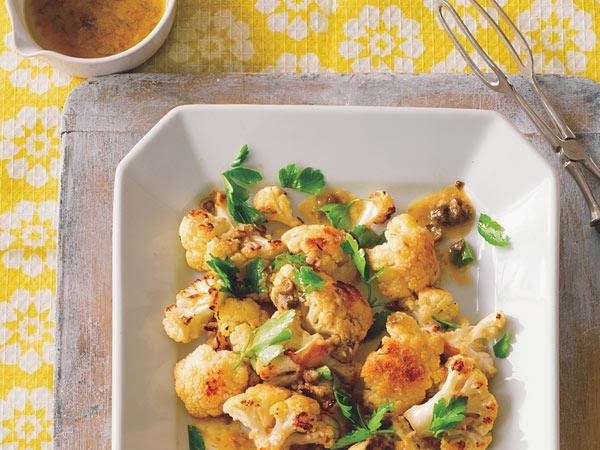 I love dijon mustard, particularly Maille Dijon Originale Mustard, and wanted to try roasting cauliflower that's been tossed in a dijon mustard sauce ... it's divine! Cauliflower is a good source of vitamin c.
Cauliflower is a cruciferous vegetable and is called this because the flowers have four petals and resembles a Greek cross. Cauliflower is actually a flower that hasn't developed yet. Cauliflower is white due to the protective leaves growing around the head so they are not exposed to the sun. Green cauliflower is produced when you cross cauliflower with broccoli. Check out my Almost Egg White Egg Salad recipe for another great way to use dijon mustard (particularly Maille)! Please note: I am promoting Maille dijon mustard as it's my favorite and I feel it is far superior to any other dijon mustard available . I have received no compensation from Maille for mentioning their product.